Human Von Willebrand Factor SimpleStep ELISA® kit (ab189571) has been re-developed with new capture and detector antibodies. This new kit has the same name but a different product number (ab223864). We have identified new recombinant monoclonal antibodies to use in the SimpleStep ELISA platform that provide a higher sensitivity when quantifying Von Willebrand Factor in human serum, plasma and cell culture supernatant samples. 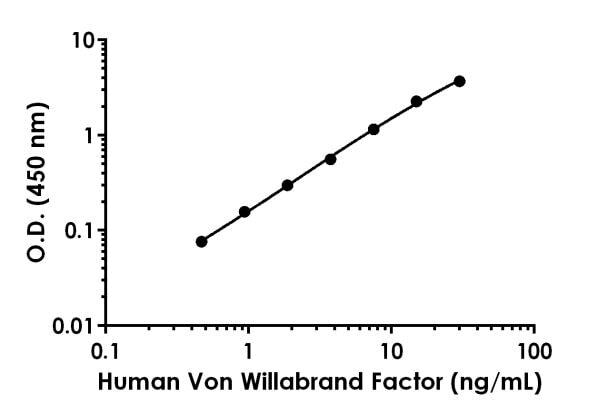 Von Willebrand Factor in vitro SimpleStep ELISA® (Enzyme-Linked Immunosorbent Assay) kit is designed for the quantitative measurement of Von Willebrand Factor protein in human serum, plasma and cell culture supernatant samples. Von Willebrand Factor is critical in the maintenance of hemostasis, it promotes adhesion of platelets to the sites of vascular injury by forming a molecular bridge between sub-endothelial collagen matrix and platelet-surface receptor complex GPIb-IX-V. Von Willebrand Factor also acts as a chaperone for coagulation factor VIII, delivering it to the site of injury, stabilizing its heterodimeric structure and protecting it from premature clearance from plasma. Our Abpromise guarantee covers the use of ab223864 in the following tested applications. The concentrations of Von Willebrand Factor were measured in duplicates, interpolated from the Von Willebrand Factor standard curves and corrected for sample dilution. 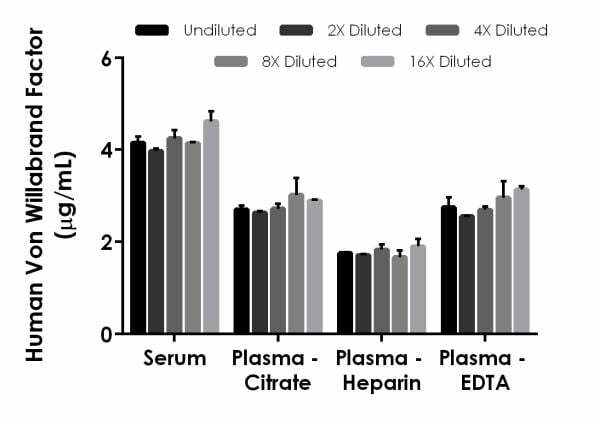 Undiluted samples are as follows: serum 1:500, plasma (citrate) 1:500, plasma (heparin) 1:500, and plasma (EDTA) 1:500. The interpolated dilution factor corrected values are plotted (mean +/- SD, n=2). 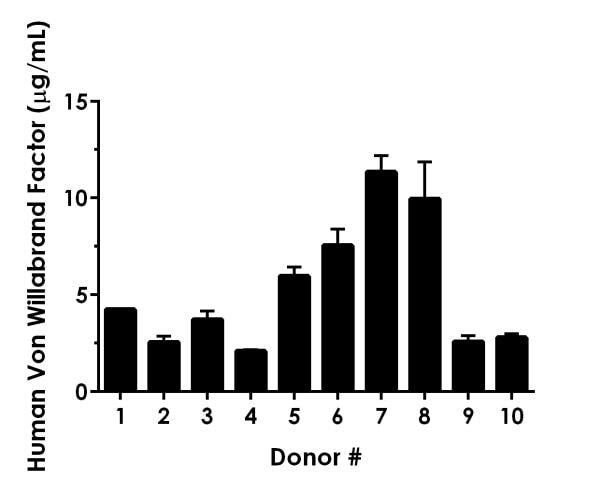 The mean Von Willebrand Factor concentration was determined to be 4.226 µg/mL in neat serum, 2.793 µg/mL in neat plasma (citrate), 1.774 µg/mL in neat plasma (heparin), and 2.819 µg/mL in neat plasma (EDTA). Interpolated dilution factor corrected values are plotted (mean +/- SD, n=2). The mean Von Willebrand Factor concentration was determined to be 5.280 µg/mL with a range of 2.088 – 11.35 µg/mL. ab223864 has not yet been referenced specifically in any publications. There are currently no Customer reviews or Questions for ab223864.